What I have decided to do is to keep a tally on the blog of what I have acquired in the last month, I am hoping this will help to curb my frenetic eBay-ing (that is completely a verb I promise) and help me understand a little more about my shopping habits. After all I thought I didn’t have a shopping habit but I have started to notice a pattern. I also want to make more of my own clothing and that’s why I am using the phrase ‘acquired’, I want to detail when I have successfully created something. These are a fantastic shape and fit. I nearly bought a 2nd pair the week after but unfortunately the dye has run in them on the first wash and they have grey lines on them making them look really scruffy and I have bought them for work so disappointed. However, my other komodo trousers are still going strong after a few years so this doesn’t put me off komodo. I am also busy chatting to their lovely customer service team who are very apologetic and trying to sort something out. 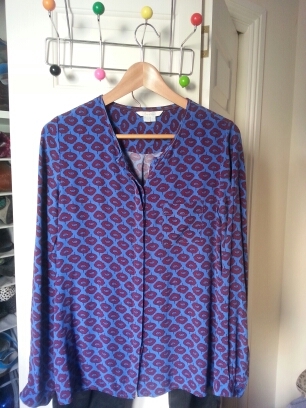 I love this tshirt, it is a boxy shape in a lightweight fabric – the main downside being the fact I have to iron it! 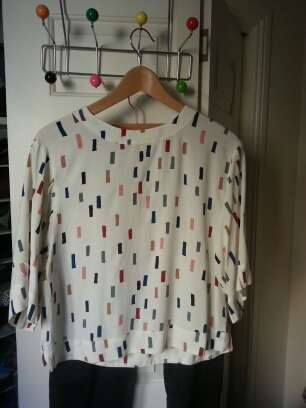 However, I did spill tomato sauce on it and that came out quite easily in the wash so I think this top is a winner. I have worn it lots, both to work and at the weekends. Definitely a keeper. This is another brilliant find. A perfect length and a really flattering fit and cut. This jumper is being worn and washed a lot already. Again I find I am wearing it for work and at the weekends. It’s flattering fit also helps me with my weight gain as it skims in the correct places. No picture as these have been sent on their merry way to the charity shop. Oh there is always one isn’t there. These are really not what I expected. I found some crappy Primark flat leopard print boots on eBay last year and walked through the front of two pairs of them (both eBay purchases but with barely any previous wear), I was truly gutted when the cobbler said there was nothing he could do and had thought these would replace them. Turns out these are actually heeled, leopard print jodhpur boots – if I don’t wear flat ones for riding why the heck would I be wearing them for play 🙂 Not my taste but in great condition. I was a little sad when I unpacked this one and tried it on, it seemed unflattering and made me feel uncomfortable. I had to iron the jersey material for my sewing class and decided to see if ironing made any difference – boy am I glad I tried that. This is now another top that is in rotation all the time although I am thinking I might pack it away for a while to allow that *new* feeling in a few months when I rifle through the packed box. Oh how I doubted this top too. I had a baggy Whitestuff top that is burgundy in colour and thought this one would be useful. It was initially itchy but a quick wash and it softened up a treat, but really it was at the May weekend gathering (my friends’ non-wedding held over two nights) it came into its own. I was cozy and comfortable while feeling like myself. 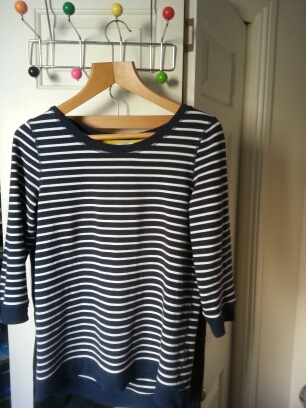 The dog wouldn’t stop cuddling into me – I think this one is a weekend jumper but just the kind I like. Finally (you might spot a Boden theme here huh? I no longer buy from them directly as their ethical statement is a set of greenwashing corporate statements in my view but their clothes are quality meaning 2nd hand items are generally in brilliant nick), another loose shirt. I wondered if this would look frumpy but with my Alice in Wonderland shoes and Komodo black trousers I think this is a really smart look for work. I think this is definitely a work shirt for me, I think this with skinny jeans at the weekend just wouldn’t feel like me. There we have it, that’s a lot of stuff isn’t it? Those are some lovely purchases Steph! The shirts are beautiful. I can’t decide if my fave is the first or the last one. Congratulations on being brave enough to know when you are ready to go back to shopping. Don’t worry too much about the quantity being too much or too little. I’ve realised I will never be a closet minimalist (and I have attempted it because all the websites and books tell me to). No matter how much I have tried I have a closet full of wild, whacky and exciting stuff and surprisingly I wear most of them. While I might not wear them every day, having the odd vintage fringed leather eagle biker vest, or vintage Nepalese pointed-hooded grey wooly jacket to throw on when the mood seems right makes me VERY happy. Plus it’s fun to start conversations with your clothes. The current grey/black/white/minimalist/normcore trend isn’t much of a convo starter… other than recognising brands that you are wearing because they are ‘on trend’. What made me feel 100% OK about my closet maximalism was watching IRIS the doco. It’s amazing. When you see Iris’s collection of wearable art you realise that for some of us, style will never be minimal. Pea-cocking is too enjoyable. Thanks Katie, I think the 1st one is a favourite of mine at the moment except I forgot about sweat stains on white â oops âº Yeah I completely understand what you mean, I keep trying to be minimalist because I feel I ought to be butâ¦.I like to dress how I feel and that isnât the same each day. One of the things that I love working at the Uni is when I see the weird and wonderful outfits the students throw together and just love, you can tell when someone loves the outfit they are wearing. I find it a bit sad when I can pick out a trend through looking out my office windowsâ¦âoh its camel coats this year thenâ. Ooh I will have to check out the IRIS documentary, sounds excellent. I think I might even manage to embrace my pea-cocking too then. Oh dang. Sweaty whites are a bummer. Hopefully you can wear it when the weather is cool. I love black silk but every time I’ve attempted another colour it looks like I’ve been swimming while wearing it. I got talked into a beautiful white silk dress with a gold sheen to it at a secondhand clothing market by a friend recently despite my protests that I would be too sweaty for it. It’s stunning, but four month in and there hasn’t been a day cool enough to wear it. I’ve attempted a couple of times only to have it stuck to my shoulder-blades and transparent before I leave the house. He he he. Glad I’m not the only one who enjoys the drama and fun of dressing differently. I find that living somewhere that only ever ‘pretends’ to be cold means I end up changing a few times a day. In summer it’s because of sweat. In winter it’s because mornings and evenings you can wear jeans and a knitted top, but midday requires shorts and a t-shirt (it’s currently 25 degrees and it’s midday). So it’s fun to have a variety of stuff. Uni’s are the best places for style watching. It’s cool you can do it from your office 🙂 Hmm, yes that minimalist, clean, structured, normcore thing persists doesn’t it? I do like all the clean lines, the abundant availability of black and white t-shirts, and the fact that everyone looks so comfortable in their jeans, tee, camel coat and sneakers uniforms but it’s getting boring to look at after several seasons. The good thing about this trend is that at least it’s encouraged everyone to invest in quality basics. Enjoy the IRIS doco if/when you get a chance to see it. Man alive, I read you post about how you donât really get a cold season where you are and I think that would be much harder dressing-wise than our climate in Scotland. We get 4 seasons in a day but hey just wear a waterproof and carry a hat (if you ever visit Edinburgh umbrellas are pointless âº). That white dress sounds lovely too, hopefully there will come a day when it is cool enough or perhaps on a trip (you know Scotland is a lovely place to visit â just working for the tourist board here). I have bookmarked your post on Netflix documentaries â that Iris documentary just looks awesome. If I can be even half as cool at one point in my life that would be amazing.